During your orthodontic treatment, there will be times when you feel discomfort or mild pain. Discomfort is a normal part of the process, but it doesn’t usually last very long. Here are some ways to cope! The team at Coquitlam Family Orthodontics always makes sure that our patients are informed about what to expect while wearing braces. It's better that they know what to expect, especially when it comes to the less pleasant aspects, so that they don't get discouraged, or feel worried that something is wrong. Discomfort, pain and soreness are a normal part of the orthodontic treatment process! It makes sense, if you think about it — the structure of your smile is changing after all, and there are going to be times when you'll feel it. That's not to say that the discomfort will be a constant throughout your whole treatment. Most of the time, it will be transitory, lasting only for a moment, a few hours, or at most a few days, before wearing off. When will I feel pain during treatment? The bulk of the discomfort you'll feel during treatment will be during the transition points. This will happen when the braces are first placed, and also during and shortly after your adjustment appointments. This pain will be of a mild, achy variety, and with some ice and maybe an over-the-counter painkiller or two, it shouldn’t last for more than a few days at most. 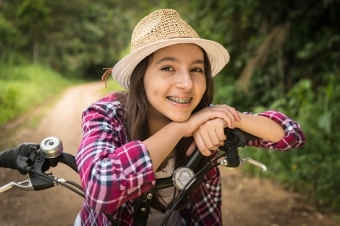 When orthodontic appliances become damaged they can cause some pain. Even in these cases, it’s more of an irritation than actual pain. Wires sometimes become loose for instance, and this may irritate the inside of your cheek. If this happens, you can bend the wire back with a spoon or another small blunt object, to get it out of the way until you can come into our office to have it fixed. Occasionally, more serious injuries and damage can also occur. If you believe you are experiencing an orthodontic emergency, or if you're experiencing unusual levels of pain that can’t be dealt with with any of the above methods, call our office as soon as possible, and we’ll make some room in our schedule to help! Contact Coquitlam Family Orthodontics to learn more about what constitutes an orthodontic emergency and to discuss your pain management options.